NEW YORK: Fireworks At Nixon-Cuomo Debate [VIDEO] - Joe.My.God. 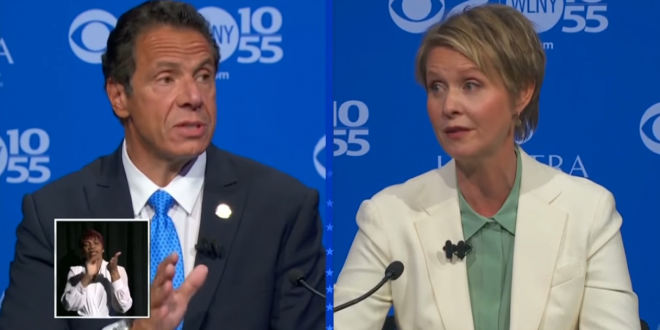 The first and only gubernatorial primary debate between New York Governor Andrew Cuomo and his Democratic primary challenger Cynthia Nixon turned into a war of words on Wednesday with Nixon calling Cuomo a “lying” and “corrupt” leader while the incumbent accused the actor-turned-politician of peddling “fiction” to voters. “I’m not an Albany insider, like Governor Cuomo, but I think that experience doesn’t mean that much if you’re not actually good at governing,” Nixon began at the debate, which took place at Hofstra University. Calling Cuomo a “corporate, corrupt Democrat,” Nixon accused Cuomo of “incredible corruption” in his administration, as well as of having “broken the New York City subway” and having “handed” the State Senate to Republicans. It was a sign of Mr. Cuomo’s advantage in his re-election that he was asked about running for president. He gave his starkest answer yet about serving out a third term. “The only caveat is if God strikes me dead,” he said. “Otherwise, I will serve four years as governor of the State of New York.” Politicians often leave themselves wiggle room when making promises, but breaking a pact involving God and death is another matter. Polls suggest Cuomo has a more than 30 percentage point lead over Nixon, who also trails substantially in fundraising. Observers had predicted that Nixon would attempt to rattle the governor in the hopes that he would misspeak. “Can you stop interrupting?” Cuomo asked at one point. “Can you stop lying?” Nixon fired back. “Either corruption or incompetence, which is it?” Cuomo responded that he didn’t know about Percoco’s activities and said he would push for greater ethics reforms if re-elected.